This app will be the napping clock that I have always wanted to use and is not in the app store. Plus I need to learn about programming a clock and timers. 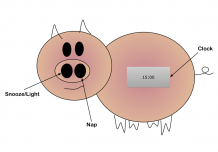 The key will be the nap feature on the right nostril of the pig, which when pressed will allow a 15min nap, 30 min, 45... and so forth depending on the number of presses/taps. I have to tweak the graphics a little, and probably ask the teacher for a few hints on some of the features. Thank you.